When do you commit to a racquet? You can’t keep changing your racquet every other match so at some point you need to make a commitment to a frame. The question is WHEN do you do it and HOW do you make that commitment? This is of course a highly personal question but at some point you need to decide what racquet you take into a competitive match or a tournament because getting used to a racquet and making it into an extended arm, is what you ultimately want for your game. As you know I love playing with new racquets every session just for the pure curiosity and enjoyment in trying something new, but it hasn’t always been beneficial to my game. So I was pretty much set on my HEAD Liquidmetal Radical Tours, but with all the racquet reviewing and play-testing I’m doing it’s hard not to get lured in by new frames. That’s why I try to give every test a good amount of time so I really understand how my game is affected by the racquet, positively and negatively and I suggest you do the same when you’re trying out a racquet. Try not to give up after 15 minutes of hitting, give the frame some time, at least a couple of hours before you decide if it’s for you or not. And remember, a fresh and different set of strings and some lead tape might change the frame characteristics drastically. As you loyal readers know, I’ve reviewed some nice frames lately and I even surprised myself by liking the Babolat Pure Drive Tour Plus (read my review), and not so surprised by enjoying the Prince Phantom Pro 100P (read my review) and even not at ALL surprised to be playing well with the Angell K7 Red (read my review) since I have enjoyed Angell frames in the past and considered switching to the Angell TC 97 Custom 18×20 (read my review here) a while ago. 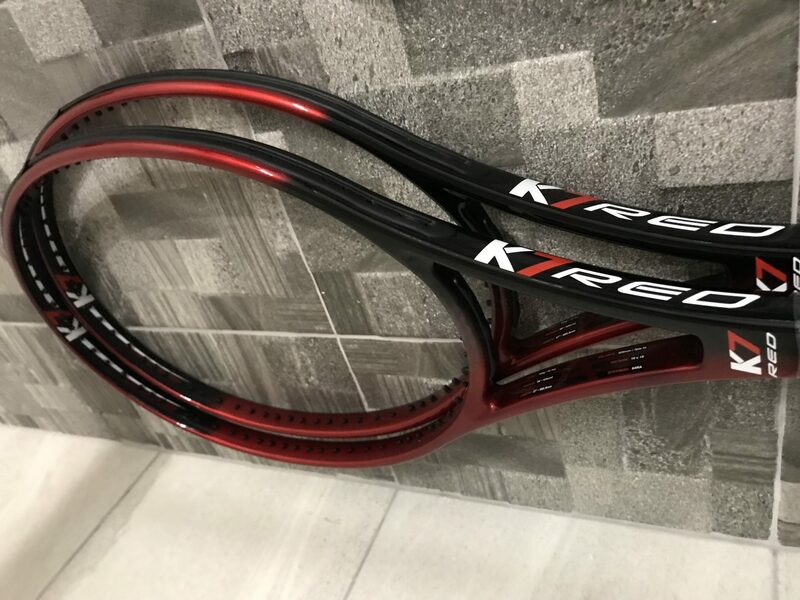 Since I’ve been accessing easier pace and spin with the Angell K7 Red than with my LM Radical Tours, I’ve decided to get two more racquets which pretty much means I’m making the switch there and committing to the Angell K7 Red for time being. It’s simply offers that great playability of lighter and stiffer frames but without hurting the arm (and I’ve been using stiff poly strings). It seems to make tennis a little easier to play for me while still giving me good touch and control so that’s why it was time to get a few more and find the right string setup. It took me a while to make this decision and I didn’t take it lightly. I was playing good tennis with the Radical Tours. I was comfortable with them, thought I’d find a good string setup. Still, on the one-handed backhand (top spin I mean, slice was good) I didn’t feel as good as I have done with, for example, the Yonex VCORE 95D, the HEAD IG Radical Pro and the Angell K7. And with this thought jumping around in my head while playing, it felt like I needed to get a racquet where that shot feels more second nature. I’ve been playing with the Angells for quite a while and although I liked them from the start, I thought it was just a honeymoon period and I did struggle somewhat on the volleys. But after practicing more at the net, adjusting the lead tape placement to improve the sweet spot and trying to really get a hundred percent dialled in, I’m really loving this racquet on court now and I’m enjoying myself every time I take it out of the bag. It’s not the perfect racquet for me by any means, I still get more pop on the serve with my Radicals for example and I feel I can kill points faster with that racquet, but for all-round performance and comfort – the K7 Red is simply a better choice for me right now so I’m switching to it. This leads me to another common question. Have many racquets should you get when you’ve made a decision on what racquet to commit to? I think two to three is a good number. I went a little bananas with the HEAD LM Radical Tours and got seven of them! I will definitely keep a pair, but I should have known myself well enough that I wasn’t going to stay faithful to one racquet long enough to need seven. Although it did look really cool in the tennis bag! I currently have three Angell K7s, the first review racquet I got had a little bit bigger grip size due to a manufacturing error so we will see if I need to beef up the other ones to match it or if I can get used to a slightly smaller size. I’m happy that the two Angells I ordered came in at the exact right weight and balance. Makes matching them with customizations a whole lot easier! Read more on this topic in the posts “racquet commitment issues” and “What racquet to choose“. Let me know if you’re committed to a racquet by now and how many of it you have. Please comment below. And good luck on the courts! Im geting stresst reading al the raquets changing you go thru. I change raquet 3 times last year a totall of 9 raquets in one year. I have now realist my raquetsholic problems are small in comparison so I can easily fit in 4 changes this year before I relise my addiction. I hope u stay fateful to you k7 they deserve it. i read all your articles and liked them. Have you tried prince textreme tour 100p? Ideally one should spend maybe a weekend or so and play test a bunch of blacked out frames, each one with the same string set-up and tension, and playing with the same partner the whole time. One hour with 3-4 racquets, keep the best 2 for the next round (like a racquets tournament). Let your partner score your performance for each racquet, do your own scoring. 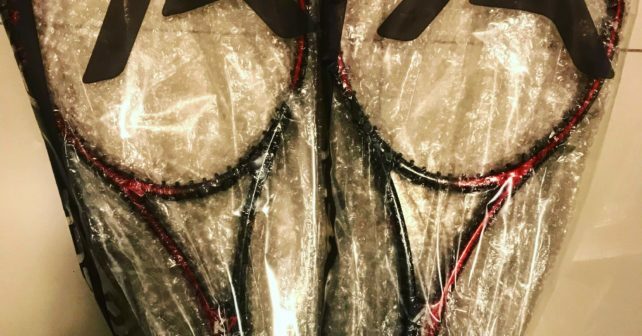 One of the problems for racquetaholics is that we “want to like” brands, models due to so many other factors than performance. I’d be very bothered if I played my best tennis with Babolat Aero Pro for example! The racquet you choose is part of your personal brand, a statement!!! Don’t you think?? I have but only briefly. Really liked the racquet! But the Textreme Tour 95 was better for me personally. after testing all the flashy, endorsed, marketed rackets you settle for a niche brand and a model that looks like a prestige from the 90s. This means something. I’m still waiting for my Tec Tflash 300 PS, did you feel it was too stiff for you? yes too stiff, also felt lighter than 300 gr. maybe matching this rachet with hyper-g string @24 kg was just too much of a novelty for me. What led you to go with the K7 Red instead of the TC97 (which I think you’d been considering)? I’m having to switch away from the Pure Strike due to some elbow pain, and I’ve been able to give the TC97 a test run, but not the K7 Red. I definitely liked the TC 97 Custom, but the feel of the K7 Red just won me over after a while. I think the TC 97 Custom plays a bit stiffer and it’s a nice racquet, but really love the ball sinking into the string bed on the K7 Red. I might have too many K7s (I have four now, so let me know if you’re interested). No matter what, I think leaving the Pure Strike is a solid choice. I also got some pain with that stick. Drop me an email if you decide to let go of any of them. Would you be able to tell how much is the swingweight difference between a 27-inch and a 27.5-inch racquet, considering that both have the same specifications? You can calculate that you increase about 10 SW points for every 0,25 inch you add. So in this case you mention it would be around 20, usually a bit less. So if the swing weight of the 27 sq inch racquet is 320, the extended version would be around 340 (probably a little lower). However trying Duel G 97 310 in parallell with TC 97 18×20 310g / 9tps hl was done. Liked Duel G better than my DR98:s but after putting Msv Focus Hex 1.18 at only 40p in the TC 97 it was magic and easy choice for me. Have ordered a second one now. Only bad thing is that it opened my eyes more for Angell frames. Mostly K7 and especially TC95 that seems to get so much cred. I agree, settling for a period of time is usually good for your tennis. Shame about the Xi98, never tried it but curious about it since Kyrgios uses it. I know Postnord is not the most reliable company around! Nice to hear you liked the thin MSV CO-FOCUS HEX, it is what I’m testing in my Angell TC 95 right now! After my first session I feel that the K7 Red is definitely more in my wheelhouse spec-wise currently, but time will tell! I have a few quetions to ask you. I’m a baseliner, so I enjoy 100″ head racquet. But, it is hard to find 100″ racquet that is comfortable. Currently I have in my bag Prince Phantom 100P Pro and Angell TC 100 63RA. Could you please compare Phantom 100P to K7 in terms od comfort, feel, power and spin. Also, If you have played with Yonex Ai 98 please compare it to K7. Prince Phantom Pro 100P is a great baseliners’ racquet in my opinion. Lots of touch on shots and directional control, but not much free power. I felt the K7 Red more powerful than the Prince, but a bit less than the Ai 98 and with a bit better ball pocketing than both. In my opinion I find K7 Red slightly better in most categories. Hope this gives you an idea. I like all three racquets, but my choice is K7 Red, because I love the feel of that racquet and it does give me enough power and control that I need for my game. The Prince Phantom Pro 100P is something I could switch to, but it felt a bit sluggish through the air and I didn’t like the head shape. Thank you very much for quick response! I’m gonna try TC 100 63RA one more time this weekend and if I decide to sell it I’m thinking of buying two matched K7 Red. Hi Jonas. Thanks for all your recent posts. I thought I would let you know I have finally committed and ordered an Angell K7 racket and halo string. Looking forward to holding and playing it! hi everybody, I am a racquet addict myself.. my path can be summarized as follows: I have 4 old PT630 and several couples of racquets: ezone dr 98, duelg 330, prostaff 97, pure strike 98 … I play for a while with a couple then go back to the protours, another pair and back to the pt and so on..
so I would say my racquet of choice is the head Pt630..
first session with the k7 last sunday, just a few shots after a doubles match played with my head PT630. Quite different as you can imagine… seemed like handling a toy. Next weekend I hope I Will be able to play a match with the k7 from the start… I’ll let you know. Yes, quite different than the PT630 for sure! But try to find a good weight and balance for the K7 and give it time. It took me a while to dial in the control and feel with that racquet. ok… first of all, I have to say that the flex of this frame is fantastic. I strung the racquet with a Gamma poly they had at my club (17 gauge, quite soft), added 2g of lead tape at 3 and 2g at 9 o’clock, plus overgrip, and it played very well. the frame is very quick and has some power also. I didn’t find a spin potential as high as the pure strike’s, but it’s very decent considered the control the frame offers. I dare say it might need a little extra weight in the hoop, at 12 o’clock, but some I like the current balance probably this would recquire a leather grip also… did you make such a trial? It’s been almost a year since you wrote of your commitment to the K7 Red, I was wondering How it was going? What string setup did you settle on? I’m considering getting one myself, but I do have a preference for box beam frames, would you consider it comparable or quite different in terms of the feel and snap back compared to a box beam? I have since been a bit back and forth on the K7 Red. The string pattern felt a bit open to me after a while, so now I am curious to test the K7 Lime in the coming weeks! I think you might like a more crisper feel than the K7 Red. If you like an Angell the TC 97 18×20 is a fine playing stick, otherwise the Blade 98 (pre-CV edition) might be something you like. If you are fine with a smaller head size, the Prince Phantom Pro 93P has that beautiful response of a box beam. Sweet spot is definitely bigger than 93 sq inches.